I am a transformational catalyst. I am an intuitive business coach and spiritual healer here to empower you to create a career (and life!) that you're totally in love with. My clients typically see a radical increase in income, fulfilling relationships, and overall enjoyment of life! I utilize the Akashic Records, essential oils, and intuitive compassionate business coaching to help you heal energetic wounds, set strong boundaries, and co-create your business in a soul-aligned way! I take high-level spiritual information and make it into tangible action steps for you to take! And along the way, I'll help you tap more deeply into your own intuition. 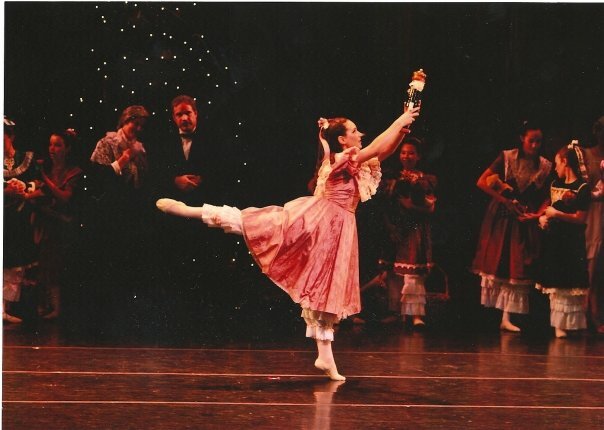 Me, as Clara in The Nutcracker. A true dream come true. Ballet was my first true love in life. I have always been highly multi-passionate. At age 5, I decided that I wanted to be an actress, astronaut, archaeologist, and the first woman on the Yankees. By the age of 12, I deeply enjoyed: ballet, softball, musical theatre, acting, hiking, backpacking, camping, 60s rock, early Jazz, and old movies. I now know (from my Akashic Records soul profile reading): It is my soul's natural groove to lean be highly multi-passionate. To deny this fact would cause deep misalignment for me. So I embrace it! Severe illness initiated me into my spiritual awakening. A chronic mystery illness made its appearance in my life at the tender age of 14. I had pain throughout my body, debilitating fatigue, depression, and so many other symptoms. It stopped me in my tracks and I'm honestly not quite sure how I graduated high school and college with such high grades. Despite the countless tests and attempts from doctors to heal me, nothing seemed to work. I was an atheist biologist. Practicing immobilizing the head, neck, and spine in EMT school. For most of my life, I was an atheist who firmly grounded her understandings of the world in science. I majored in Biology in college and trained as an EMT (Emergency Medical Technician -- you know, the ambulance people). I had a deep desire to help people heal. I embodied the flavor of feminist atheism in which I couldn't separate God from hateful, oppressive politics. I thought that people who felt energies of crystals were weird. I didn't understand what it was like to have a "spiritual" experience. In the depths of my chronic illness, something inside me urged me to explore my innate sensitivity toward intuition and energy . . .
My first Reiki class sparked something deep in me. It was a coming-home. It was a means of understanding my own body's energy, and a means of relating to the world differently. It was as catalyst for my own personal healing, as well as my personal journey. My whole world-view changed. I came to understand and claim my own personal power. I opened up to the Divine. Since then, I've had a ravenous hunger to learn, learn, learn. It's felt like I'm catching up on lifetimes of learning. Really, it's been a remembering. This is not my first lifetime as an intuitive. And I'm going to guess it's not your first lifetime as an intuitive, either. Plants are some of my favorite mentors. I love working with them via essential oils, ceremonial cacao, and walks in nature. I am also mentoring with Mother Mary and Mary Magdalene (in the very, VERY non-traditional sense. Perhaps you feel their presence in my energy and on this site). I am both a shadow-worker and a light-worker. I help you bring love to your shadows, while you lean further into your inherent brilliance. I am not afraid of your depths, as I have ventured throughout my own. As I soul, I have spent lifetimes studying how to help people heal and return to WHOLENESS and LOVE. I am designed to hold you in a space of non-judgmental, compassionate love so that you can see yourself as WHOLE and brilliant. I honestly see the best in people and I thrive on close personal relationships (many of my offerings reflect that!). I need a HIGH amount of variation in my life and often joke that I have a "spiritual flavor of the week." That's perfect for my soul -- I need to cycle through hobbies and interests fairly rapidly. What do I do "outside of work"?? Well, I do think about the Universe, energy, spirituality, and the wisdom of plants ALL THE TIME. Visiting Sedona, Arizona. The vortex energy was amazing! I'm a California native. I lived in Colorado for 4 years and then I moved to Boston, which is where I've lived for the past 3 years! I love living in different places because it teaches me so much about society, culture, and the assumptions about the world that I've held. I'm a Gemini, Libra rising, Virgo moon! I am a true ambivert, which means that I am about 50:50 introvert / extrovert. Though I'd guess I'm slightly more extroverted! I have researched in a neuroscience lab at Johns Hopkins and I have worked in a botanical lab (I grew and measured 1,000 plants one summer!). Many of us have incarnated at this time because we are in the midst of major paradigm shifts. Let's create magic together! My 1-1 programs are highly personalized. Check out the workshops and group programs I've created! These "plant angels" can support you in all aspects of your being -- mental, physical, emotional, and spiritual / energetic.